The definition of beriberi is a disease that comes from a lack of Thiamine or B1. There are two types of beriberi: wet beriberi and dry beriberi. 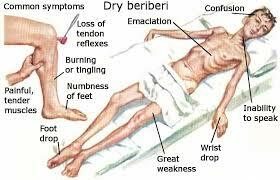 Dry beriberi is a disease of the peripheral nerves that causes pain and numbness in the extremities. 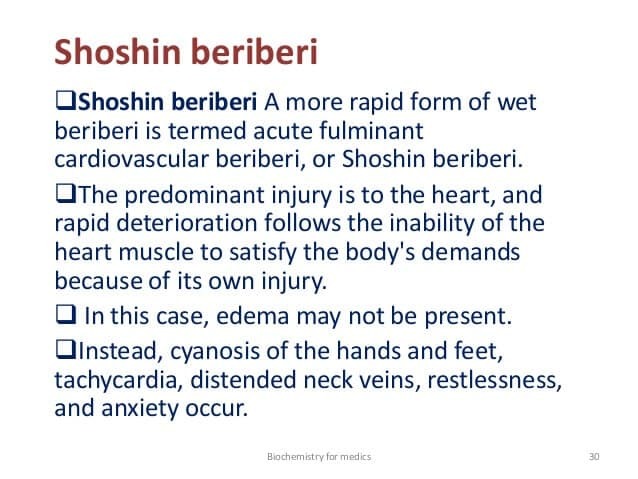 Wet beriberi affects the heart and can cause congestive heart failure. 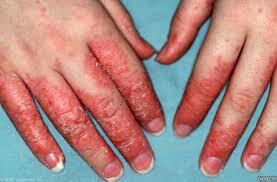 Beriberi is caused by a vitamin B1 or thiamine deficiency. Thiamine deficiency is one of the causes of heart failure. In these patients, once thiamine is replaced, the heart failure can be reversible. 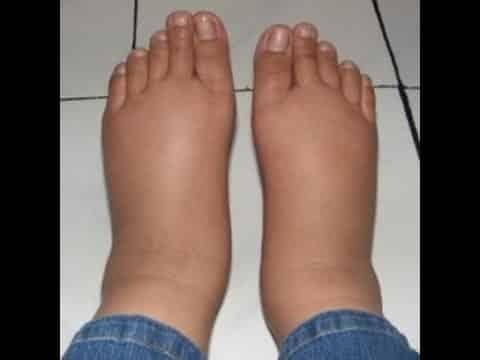 This article will discuss the definition of the two types of beriberi, and some pictures of how people are affected. Heart failure is defined as a chronic condition in which the heart cannot pump blood properly. In some countries, beriberi is related to a high intake of alcohol. The reason why alcohol causes a thiamine deficiency is that many alcoholic patients get gastritis which leads to nausea, anorexia, and vomiting. Alcoholic patients also tend not to eat a healthy diet. Thiamine is also a water-soluble vitamin. This condition of beriberi is not to be confused with alcoholic cardiomyopathy. Heart failure from beriberi responds to thiamine, heart failure from alcoholic cardiomyopathy does not respond to thiamine therapy. People who take water pills are susceptible to this disease because thiamine is water soluble. 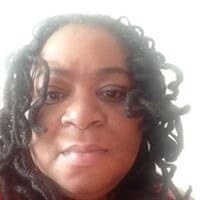 People who have had any kind of stomach surgery because of the absorption issues. People with immune deficiency disorders such as HIV/AIDS are susceptible. In certain countries like Thailand, beriberi is common. Populations who eat mill rice are susceptible. In beriberi, the heart is slightly enlarged and after treatment, the heart size returns to normal. The Hartfell your is predominantly on the right side. This term is called right heart failure. On the EKG, the patient usually presents with an elevated heart rate. 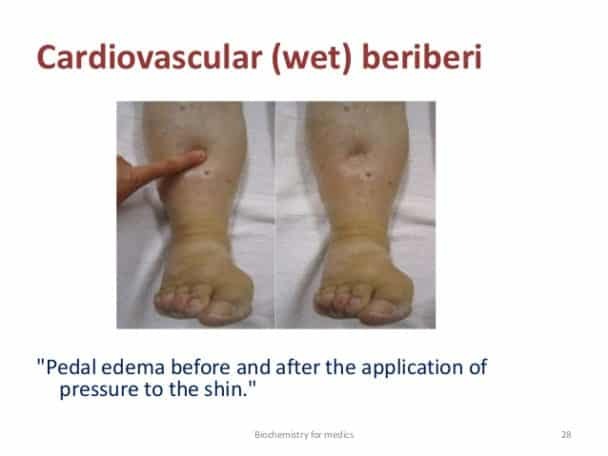 Wet Beriberi – Wet Beriberi is known as a heart disease. It is characterized by a high cardiac output, hypotension, and with right-sided heart failure and acidosis. In Western countries, beriberi is caused by alcoholism or other metabolic diseases that affect the metabolism of B vitamins. 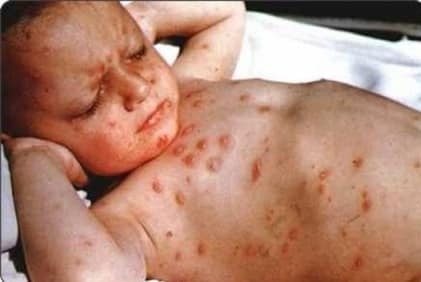 Wet beriberi is seen as a rare disease in developed countries. However, with the increase of diuretics, and poor dietary habits of people in developed countries, we are seeing an increase in the incidences of wet beriberi. 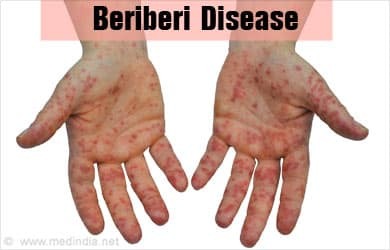 Wet beriberi is commonly missed that is why it is important for healthcare professionals to be aware of this disease and the implications. In this study, there was a case of an 87-year-old man presenting with symptoms of in cardiogenic shock. He had low blood pressure, increased heart rate, increased respiratory rate, and EKG changes. His Xray showed pulmonary congestion and cardiomegaly. At first, the doctors thought he was in shock because of the acuteness of his cardiac event. The pt also had to go on a ventilator for every respiratory distress. 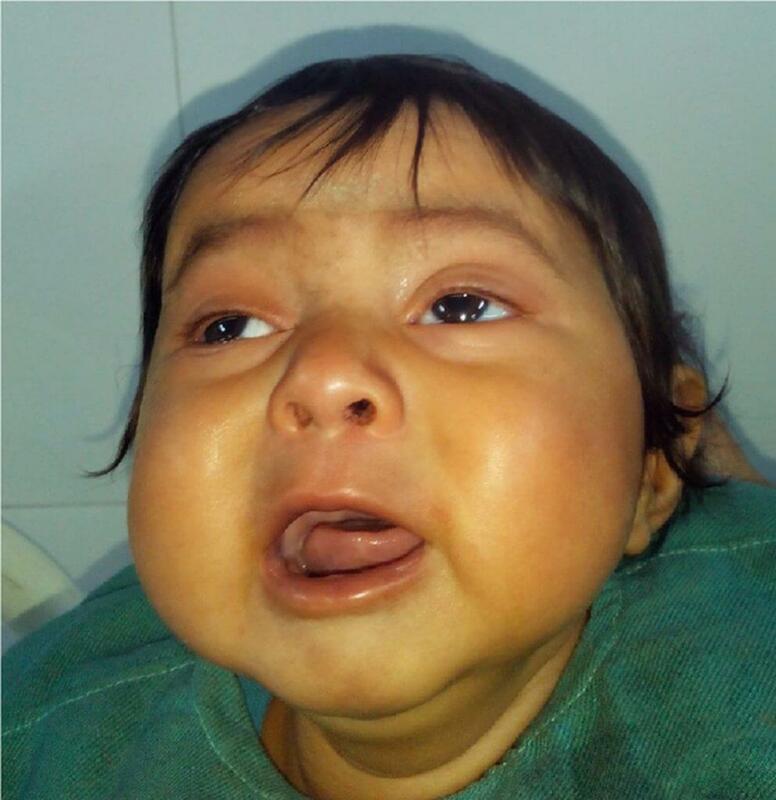 The patient had previously been on IV food therapy for the previous 9 months because of abdominal surgery. This abdominal surgery predisposed him to a thiamine deficiency. The doctors checked his thiamine level, and it was very low. He was given Thiamine 100 mg intravenous, and he had a dramatic improvement. Three hours after the infusion, the patient’s heart rate decreased, blood pressure stabilized, and the lactic acidosis resolved. 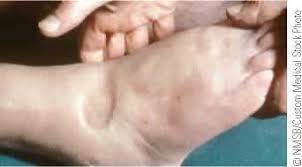 Dry Beriberi – Dry beriberi is known as peripheral neuropathy. There was a case presented in the literature of a 49-year-old man who presented to the hospital with progressive weakness of both lower legs for approximately seven months. He was initially diagnosed with mild peripheral neuropathy, however, over the next four months, he developed numbness in all four extremities. Upon further examination, this patient was found to have extensive nerve changes in all four extremities. His vitamin B1 Level was checked and he was found to be deficient. Once he was treated with thiamine, he showed significant but slow improvement.